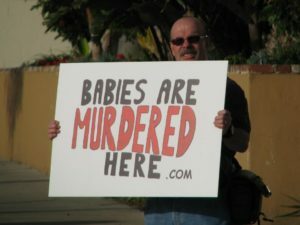 Mission Hills, California — Approximately fifty pro-life Christians are surrounding a popular abortion facility in Mission Hills, California today to expose and reprove its participation in the nation’s murder of unborn children. Event organizer, Tony Miano, a full-time evangelist, blogger and talk show host, states that he is deeply disturbed that Mission Hills Family Planning Associates is shedding innocent blood in his own back yard. Miano stated that he has tried to express his concerns to the managers of the building that houses the abortion facility, but they have not been receptive. Therefore, Miano said that he decided to recruit other Christians to join him outside of the facility to speak out against its presence in Mission Hills. His goal was to enlist 50 Christians for today’s event — one for every baby that is killed each day at Mission Hills Family Planning Associates. Miano and the group met in Los Angeles last night to create the signs that they are displaying on the streets today, all of which simply declare, “Babies Are Murdered Here!” They also joined together for a time of prayer and the reading of the Scriptures. Miano said that a number of participants will be preaching the Gospel on the streets today as a part of the effort. The producers of the upcoming documentary Babies Are Murdered Here are among those participating in the event, and will be filming footage for the hard-hitting movie. Babies Are Murdered Here, helmed by Crown Rights Media, analyzes and investigates both the good and bad aspects of the pro-life movement in America, the silence of the Church in the face of bloodshed, and the real life stories of men and women who are on the front lines of the abortion battle to rescue unborn children who are condemned to death.